May is Military Appreciation Month, which provides an opportunity to recognize and thank those who selflessly serve our country with honor and dignity. This includes 1.2 million active service members along with over 800,000 reservists. They all deserve our gratitude and appreciation for the sacrifices they make each and every day. At Palmetto Goodwill we want to do more than simply recognize our service members’ efforts. That’s why we have a program specifically designed to help military personnel transition to civilian life when the time comes. Through Palmetto Warrior Connection (PWC) and programs like Operation: GoodJobs we focus on giving back to our military personnel who have given so much to us. The U.S. Department of Veterans Affairs estimates more than 250,000 service men and women return to civilian life each year. The transition is oftentimes extremely difficult. Whether it’s from physical battle wounds or psychological distress, many veterans returning home find it difficult to reintegrate into society, the workforce and family life. These challenges can cause stress, depression, and feelings of isolation for both the veteran and their family members, making it difficult to achieve financial and emotional stability. PWC is proud to walk with veterans every step of the way, working to build a community of self-sustaining Warriors that can not only stand on their own, but have a solid support system that understands their unique struggles. It provides a safe place for local veterans to turn and allows them to work with a dedicated team instead of reaching out to multiple agencies to get access to the resources and programs they need to be successful. One such example is Operation: GoodJobs, where participants gain the skills needed to connect to meaningful civilian work through: support and stabilization services; individualized career assessments; financial planning; and job training and placement services. 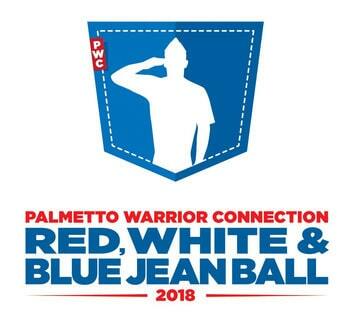 You can be a part of this effort too by supporting awareness efforts like Palmetto Warrior Connection’s upcoming Red, White & Blue Jean Ball on Friday, June 15 at Founder’s Hall in Charles Towne Landing. This event helps PWC build awareness and support for transitioning Warriors. What better way to celebrate Military Appreciation Month than by supporting efforts that assist our military and their families as they transition to civilian life. With your support we can ensure our military and veteran population is cared for and given every opportunity for a successful reintegration and a thriving future.